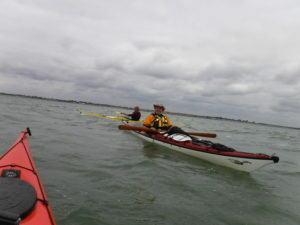 After a lot of chat on FB messenger on the lead up to the weekend three of us decided to paddle from Bradwell to Colne Point. 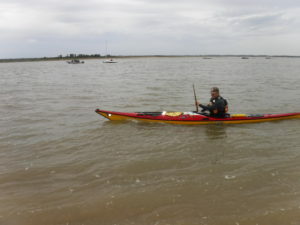 The wind and tide wasn’t going to be in our favour SE F4 and an ebb tide helped us along our way. 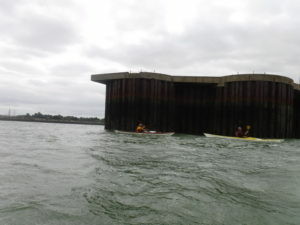 We made excellent progress but were very aware of the strengthening wind and the increasing swell, so decided to paddle until the tide turned (LW Bradwell 11:15), which put us in spitting distance of Colne Point! Making our way back the swell had increased with 1 – 2′ waves and the relentless wind, however, we made really good progress. 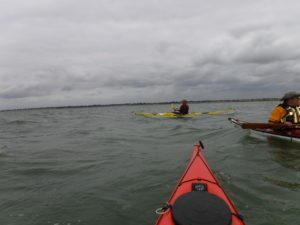 It was a lot of fun bashing through the waves, a couple of yacths decided to furl their sails and revert to motoring and a lone windsurfer was buzzing us going from Mersea Island to Sails Point at incredible speed. 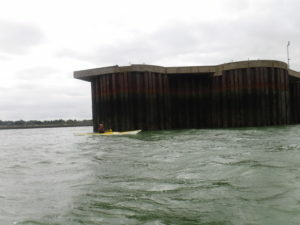 We arrived at the entrance to Bradwell Marina, and since we had got there much earlier than expected decided to go around the baffle at the entrance only to spot a very angry looking pigeon sitting on the baffle top. 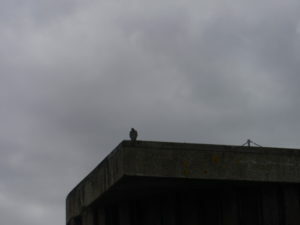 It turned out to be a perigrine Falcon, and he/she didn’t look very happy at us paddling in its hunting ground. Going back into Bradwell Marina an unhappy yacthsman and his crew were well and truly grounded at the entrance, scratching their heads whilst waiting for the tide to fill in. 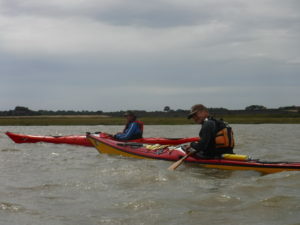 Thanks to Adrian (MAD cc) and James for a great couple of hours on the water. 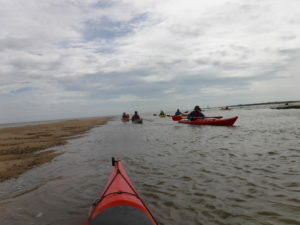 A mixed bunch of eleven kayakers from BCC, MAD, and Braintree CC set off from Dovercourt, Harwich to paddle the backwaters and see the seals. 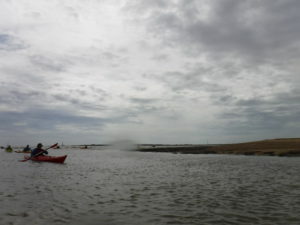 Leaving the north sea and entering a small inlet was like stepping/paddling into a different world, very quiet and serene. 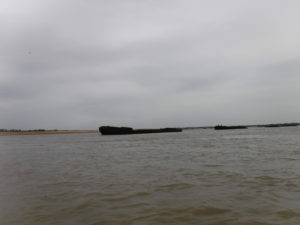 The tide carried us through the maze of waterways to the seals laire, big rusty beasties sunbathing on the mud. 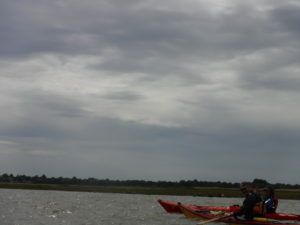 The seal sightseeing boat came around a bend and stole our private veiwing of our blubbery friends, so it was onwards and forwards against a strong southerly wind F4, punching our way to the main channel to join the ranks of the sailing boats out enjoying themselves. Sorry no pictures of the seals as my camera lens got water on it and blurred the lot! We stopped off at Stone Point for lunch and watched the very strong tidal race play havoc with the big motor launches making their way to the Marina. 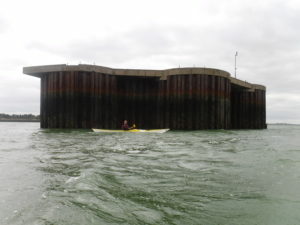 It was then time to make our way home, we paddled across the estuary to the sunken barges, avoiding the main tidal race and rejoined the North Sea. 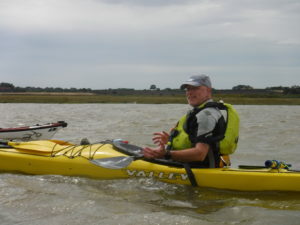 Eleven very happy kayakers would like to thank Barry I for organising this trip.